The following is the What Should Be entry for Pruitt-Igoe Now, a recent design competition aimed at generating ideas for the infamous site. What follows is our presentation board and cover letter. We will break out individual pieces of this proposal and expand on these ideas in future posts. The odd sanctity that is an untamed forest in a city core stands as a living, evolving memorial to the historical complexities of the site and of the past failures to address urban decline in meaningful, productive manners. This solution preserves portions of the forest as a measure of respect to the history of this place, and as a tangible symbol of its continued evolution. The balance of acreage is intended to unify the fragmented urban fabric, and will encompass elements that encourage a strong, active future for the community. To overcome the vexing scale of the Pruitt-Igoe grounds, the unwieldy super block geometry will be dismantled. 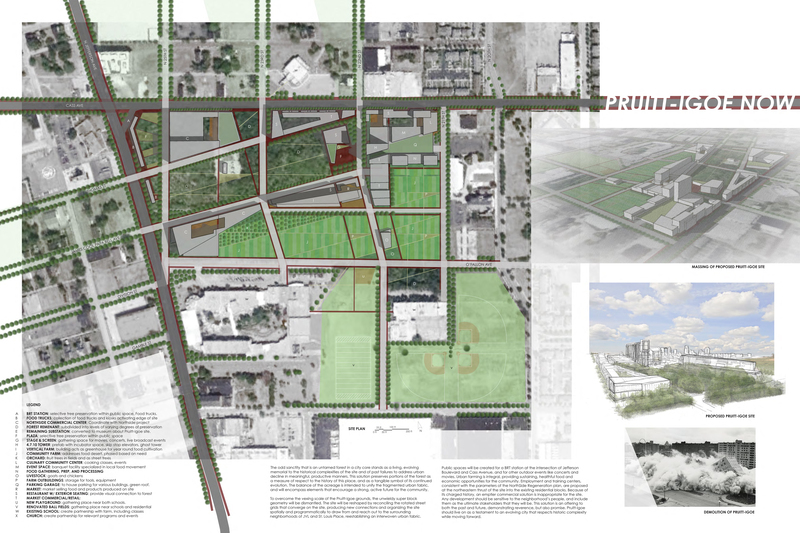 The site will be reshaped by reconciling the rotated street grids that converge on the site, producing new connections and organizing the site spatially and programmatically to draw from and reach out to the surrounding neighborhoods of JVL and St. Louis Place, reestablishing an interwoven urban fabric. Public spaces will be created for a BRT station at the intersection of Jefferson Boulevard and Cass Avenue, and for other outdoor events like concerts and movies. Urban farming is integral, providing sustaining, healthful food and economic opportunities for the community. Employment and training centers, consistent with the parameters of the Northside Regeneration plan are proposed at the northeastern thrust of the site into the residential blocks. Because of its charged history, an emptier commercial solution is inappropriate for the site. Any development should be sensitive to the neighborhood’s people and include them as the ultimate stakeholders that they will be. This solution is an offering to both the past and future, demonstrating reverence, but also promise. Pruitt-Igoe should live on as a testament to an evolving city that respects historic complexity while moving forward. Should I get a Reflecting Absence vibe from this? I’m pretty sure the school already has a community garden, maintained by the Sierra Club. I think you’ve designated it as a playground.